PandaDoc is a leading workflow approval software solution that provides an intuitive and fast way to designate approvers, create signing orders, and much more. Who uses PandaDoc workflow approval software? PandaDoc helps sales leaders ensure that each quote, proposal, or contract is approved by everyone that needs to see it before going out to the clients. The entire process of setting the designated approvers and tracking past document activity can be automated so that it’s as easy as pressing a button, even when using a mobile device. Marketing managers need a reliable and efficient way to process and approve documents, and PandaDoc workflow approval software makes it a breeze. Every template document that uses the approval workflow won’t be sent out before being approved by all necessary parties. PandaDoc document approval workflow software allows sales directors to manage the entire approval process. It comes with a range of powerful tools for designating the essential approvers for each document template, setting up customizable signing orders so that everyone signs a quote in the right order, and even tracking past document activity for quick audit. What is workflow approval software? PandaDoc workflow approval software gives companies complete control over their documents. By enabling the Approval Workflow feature in any document template, you can designate a list of approvers and recipients to ensure your proposals are 100% ready to be sent. There’s also a versatile signing order function which allows signing any document in a particular sequence, with each recipient receiving an email notification when it’s their turn to sign. 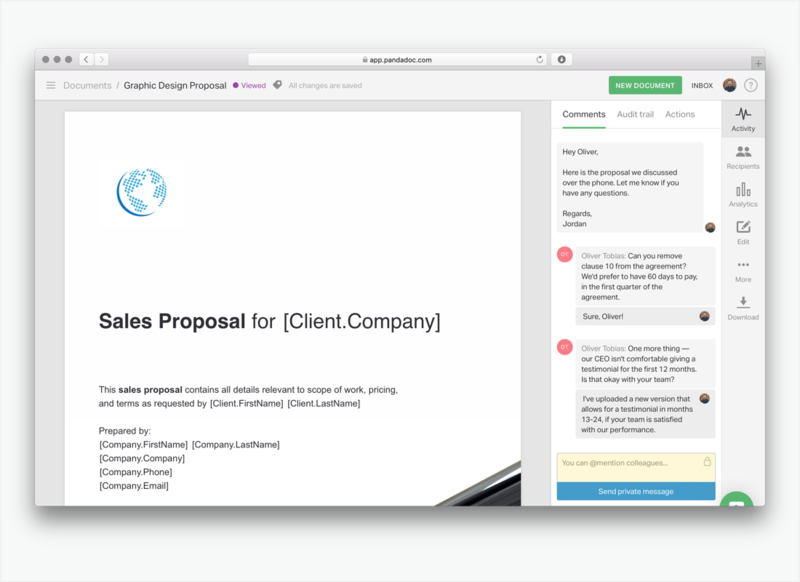 Finally, you can track all activity of your proposals and contracts. The entire process is designed to be as simple and streamlined as possible while ensuring the chance of error is reduced to a minimum. Why should you start using PandaDoc workflow approval software? Workflows automate numerous processes for each document such as approvals and signing orders. With the help of PandaDoc approval workflow software, organizations can designate approvers for each quote or contract and automate the internal workflow, ensuring that each document is approved correctly. With PandaDoc, managers can set up multiple approvers or groups of approvers for different proposals and review the designated approvers and recipients on the documents list, making it easy to check which members are associated with each document. There’s also a convenient signing order feature which ensures recipients can sign in a particular sequence by providing email notifications for every recipient when it’s their turn to sign. You can set up approver groups that can be quickly added to the workflow of any document template so that you don’t have to add individual approvers each time. This helps make the approval process even faster, designating approvers for each template in seconds. With PandaDoc workflow approval software, you can create custom roles for approvers or recipients, which allows you to have complete control over who has access and editing permissions to your documents and templates. Make use of the full potential of PandaDoc with the help of our robust integrations that can help to quickly generate proposals and quotes, automate workflows, and integrate payments. PandaDoc is a versatile software solution that handles creation, editing, approval, and sending of proposals, quotes, and contracts for almost any company. We offer a wide range of features that enable you to customize your workflow to fit your individual requirements. Keeping your documents safe is vital, and PandaDoc utilizes the most cutting-edge security measures to ensure that all of your sensitive information is always protected from outside threats.